Once Microsoft's Internet Explorer (IE) used to be the most used web browser worldwide. But gradually the number of users came down and it is observed that it is trying very hard in recent competitions with other brands to make a come back in the niche market. With a new campaign in their website rethink, it wished to catch the stream line like it used to hold in earlier days. "What if Internet Explorer could show you a web that did things you didn't think were possible? From gaming to entertainment, we are helping to create entirely new experiences on the web that are fast, beautiful and perfect for touch. See for yourself below." 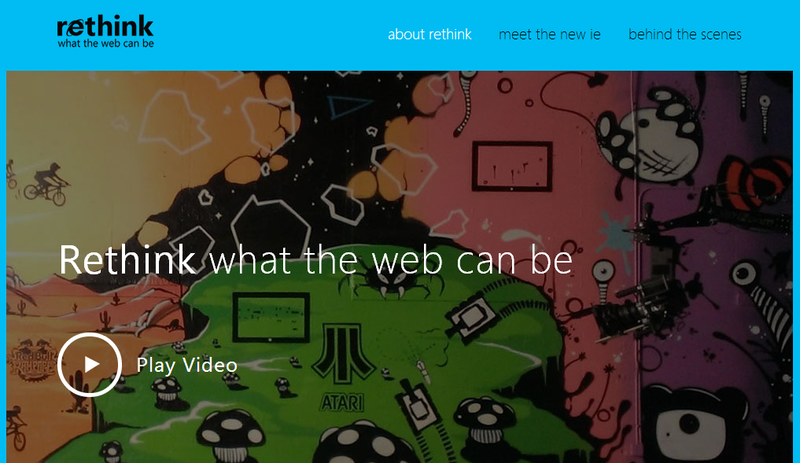 rethink-ed by Microsoft. Nowadays people are keen in using more popular browsers like Firefox and Chrome. Microsoft hasn’t given up the hope. In its latest release, IE11 is coming with support for touch screen devices and is faster and more efficient as a whole. Microsoft made partnerships with Red Bull, Atari and GlacierWorks and other developers. The main effort is to help create a new experience for IE11. So it launched its “Rethink IE” campaign to create some positive response among the internet users news about the browser. The very new IE’s features would provide a full screen browsing, multitasking, reading view and a feature that allows users to pin websites. Although it comes with a similar look to Windows 8 with its tiled menu comforts tablet users too. “We are helping to create entirely new experiences on the web that are fast, beautiful and perfect for touch,” quoted by Microsoft's Rethink website. Lets see the response from internet users with the new features IE11.